Outdoor shade covers and umbrellas block UV rays and directly address rising concerns about the potential of ultraviolet light exposure to cause skin cancer. The best in modern technology and the best in convenient installation is combined in a number of model design that address the needs of specific organizations and applications. Bleacher style shades are more cost effective than the traditional metal and wood shade covers in the past. They are made of a patented fabric called Sun-Tec® that retards 95 percent of the harmful UV rays of the sun. Adults and children alike can have more time outside without having to worry about sunburn or the long-term risk of skin cancer. One advantage that theseoutdoor shade covers offer over umbrellas is their ability to cool down temperatures. The netting design of the fabric allows hot air ti rise through it, keeping the air and ground beneath the canopy a consistent 20 degrees cooler than the air above it. With metal and wood, heat actually increases under the cover because the hard surface traps the heat and radiates it back downward toward the ground. An even greater cost benefit offered by these overhead shades is the protection of non-organic material. Plastic and paint will be less likely to degrade because direct sunlight is not striking their surfaces. 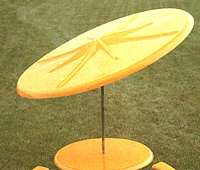 Cantilever shade covers feature a unique design that eliminates the need for supporting posts on two of the four corners. This is ideal for large outdoor events and parks where maximum access and visibility are important. Many organizations prefer something smaller and more attractive than an outdoor shade cover. Umbrellas serve these purposes quite well. Not only are they something with which we are all familiar, but they are extremely utilitarian and can be highly decorative as well. Coffee shops, patio cafes, and small pubs love umbrellas for their ability to instantly compliment exterior décor and create a sense of private, individual shading for each and every table outside. Perhaps no organization, however, benefits from them more than swimming pools. Because people want some controlled exposure to sunlight to work on their tan, umbrellas gives people respite from the sun any time they, yet they keep them only inches away from getting back into the light if they want to tan further. 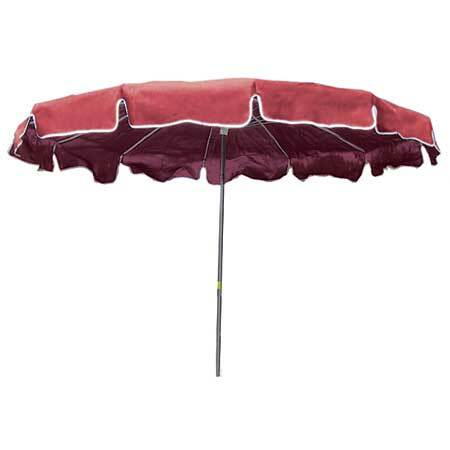 Like outdoor shade covers, umbrellas are most commonly made of fabric. This fabric is of a high commercial grade that is designed to weather all sorts of temperature and seasonal extremes. Strong winds will not tear it, and heavy downpours of rain will not collapse its structure. In humid areas where mildew and mold are concerns, the fabric must also be resistant to spores to prevent the buildup of these fungi on its surface. Finally, fabric umbrellas must also have UV inhibitors to block color fading and fabric deterioration. Some companies, however, do not need the heavy duty performance of an outdoor shade cover or fabric umbrellas. For these organizations, vinyl is an attractive alternative. Although not as durable as fabric, the vinyl has a measure of wind resistance due to a wind vent at the top. Fiberglass umbrellas, on the other hand, are super wind resistant and should be used in coastal areas where gale force winds often sweep in from the sea. These are very large umbrellas as well, measuring 7 to 8 feet across, and highly UV resistant to offer plenty of protection from the sun.